Another principal Shakti abode of Maharashtra; dedicated to Mahalakshmi- the Hindu Goddess of wealth and prosperity. 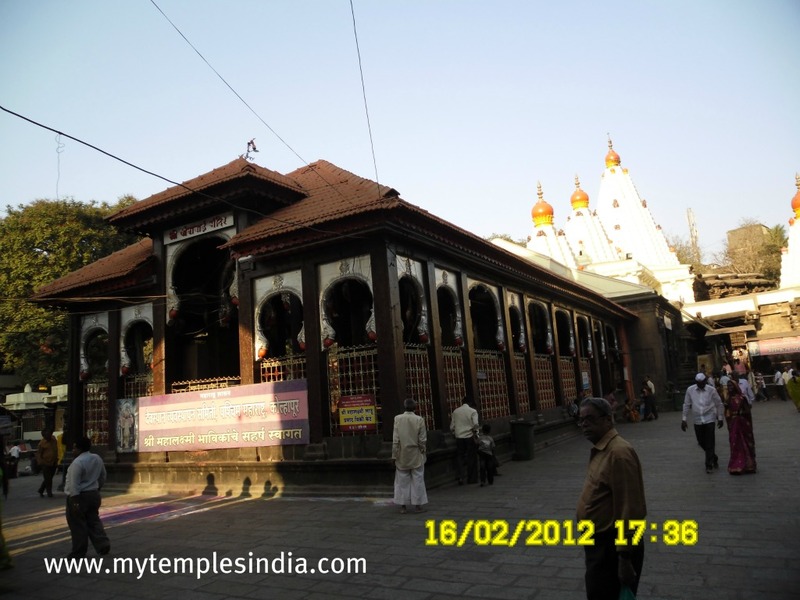 The legend says the Goddess Mahalakshmi killed a demon called Kolhasur here, hence the name Kolhapur. In ancient time this place is also known as Karavira Puram and the devi as Karaviravasini. The idol of Mahalakshmi, carved in black stone, is 3 feet in height. The idol of the four armed and crowned goddess is said to have decorated with gemstone, which weighs about 40 kilograms. It is mounted on a stone platform. A stone lion, the vahana of the goddess, stands behind the statue. The original temple was built by the Chalukya kings around 8th Century. An earthquake destroyed it. Following that, the temple was fallen out of worship for a long period. It was the Maratha rulers who revived the worship and re-built the temple in the 18 nth century. The ruin of the old temple is still visible. Unlike the most Hindu temples, which face either East or North, this temple faces West. A peculiar thing is that during certain days in the year the rays of the setting Sun touches the feet of Goddess Mahalakshmi through a small window. These days are celebrated as Kiran Utsav, which attracts many devotees. These days usually are at evenings of 31 January, 1 February, 2 February, 9 November, 10 November, and 11 November. During the three day Ratha Sapthami festival, which usually falls in January, rays of the Sun god falls on Devi�s feet on the first day, on abdomen on second day and on her face on the third day. This also attracts a large crowd to the temple. Kolhapur is 240 kilometers from Pune, on the busy Pune-Bangalore National High Way.